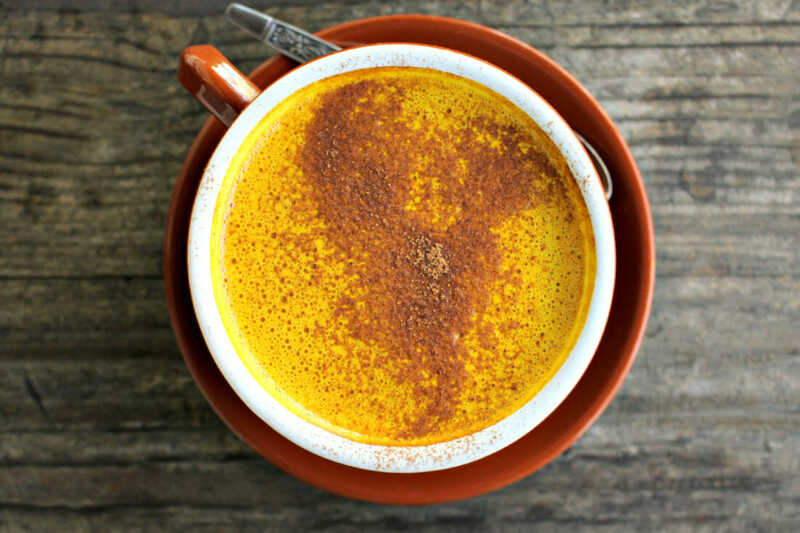 Turmeric lattes aren’t just another hipster-café fad—these frothy yellow steam-cups taste amazing and are packed full of antioxidants and other health benefits. Include this brew in your daily ritual, and you’ll boost your immune system and pump goodness into your bloodstream first thing each morning. Well then, what’s not to love? According to Google, turmeric was the most searched health topic of 2016. Curcumin, the antioxidant that gives turmeric its golden hue, has been linked to the prevention of cancer cell growth and management of inflammatory conditions, such as arthritis, asthma, eczema and inflammatory bowel disease. Other research shows turmeric has similar effects on the body to ginseng, which is said to improve cognitive function. Drinking turmeric milk daily may help purify the blood and detoxify the liver. Turmeric is also said to slow the progress of Alzheimer’s disease. In India, where the turmeric latte hails, the tradition of a pre-bedtime “haldi doodh” or turmeric milk has been popular for centuries. It’s also an Ayurvedic treatment for the common cold. Turmeric, a rhizomatous herbaceous perennial plant of the ginger family, is native to southern Asia and has been used in cooking and traditional medicine for thousands of years. Turmeric is considered auspicious and holy in India and is a main component of Hindu wedding and religious ceremonies. The main ingredients of an Indian haldi doodh include fresh turmeric, a few peppercorns, a cup of water with a cup of milk, honey and ghee if the throat is sore and needs coating. Used as a medicinal drink, the ingredients are basic and intentional. In the West, however, the drink transformed to include cardamom, cinnamon, ginger and vanilla. Turmeric is best absorbed by the body when served in a glass of warm milk and with peppercorns (increases the absorption of curcumin). Because of the root’s low bio-availability, milk provides just the right amount of fats and proteins to ensure the turmeric is absorbed. In India, cow’s milk is typically the norm, but in the West, recipes tend to exclude this main ingredient and opt for coconut, almond and even cashew milk instead. Across the Sunshine Coast, local cafes are serving up this frothy golden drink using both blends and their own mixtures. I drank my first cup at Berkelouw’s Cafe in Eumundi with coconut milk and fell in love! They sell a mixture from the shop made by Nature’s Harvest from Perth, WA. Sunspace Café in Doonan, also serves up a yummy golden mylk which goes perfectly with their garden views. In fact, I love golden mylk so much, I’ve given up coffee completely! How does it taste? I’m a huge chai latte fan, so while not a vast difference from that spicey brew, the golden mylk does have its own unique flavour. For starters, it’s warm, spicy and very earthy—which is why it feels so grounding. I find, if you don’t add enough honey and cinnamon, it can be a bit like drinking curry. I prefer mine with some vanilla and cayenne pepper for an extra kick. Anti-inflammatory, anti-oxidant, antiseptic, analgesic + anti-carcinogenic (chronic, low-level inflammation plays a major role in almost every Western disease and oxidative damage is believed to be one of the mechanisms behind aging and many diseases which is why antioxidants are so important). Blend all ingredients (except honey and milk) in a high-speed blender until smooth or crush using a mortar and pestle. Heat milk in a small sauce pan 3-5 minutes over medium until hot but not boiling. Add honey and turmeric mixture and drink immediately. (Please note, anything tried and tested for 5,000 years by an entire Asian continent tends to get a high rating of success in our book no matter what the modern medical establishment thinks about it—but we are not claiming to be health professionals. Check with your own personal health team before you supplement).